Together at last! 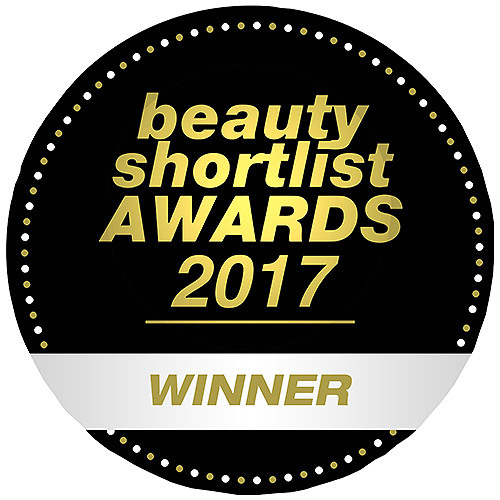 Our 3 absolute skincare best sellers: Hyaluronic Serum 200, Daily Renew Facial Cream and Radiant Glow Mask. All you need for a deeply moisturised, plump and smooth skin. Contains Hyaluronic Serum 200, Daily Renew Facial Cream and Radiant Glow Mask. The Hyaluronic acid contained in both the cream and the serum is a miracle worker aiming to help to reduce wrinkles, making the skin look younger with an improved skin tone. Argan Oil in the cream has powerful anti-oxidants, helping to improve elasticity and leaving skin feeling plump and soft. The mask, with raw cacao powder, coconut granules and clay revitalises and purifies, whilst buffing the skin to silky perfection. Evolve Hyaluronic Serum 200 10ml. 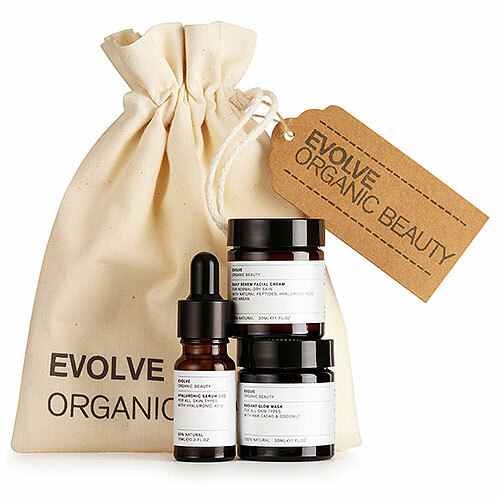 Evolve Daily Renew Facial Cream 30ml. Evolve Radiant Glow Mask 30ml. Aqua (water), Aloe Barbadensis Leaf Juice*, Parfum (Fragrance), Cetearyl Alcohol, Helianthus Annuus (Sunflower) Seed Oil*, Butyrospermum Parkii (Shea Butter)*, Coco-Caprylate/Caprate, Prunus Armeniaca (Apricot) Kernel Oil*, Sesamum Indicum (Sesame) Seed Oil*, Candelilla/Jojoba/Rice Bran Polyglyceryl-3 Esters, Glyceryl Stearate, Argania Spinosa (Argan) Kernel Oil*, Glycerin*, Plukenetia Volubilis Seed Oil*, Cetearyl Glucoside, Mannitol, Sodium Stearoyl Lactylate, Dipalmitoyl Hydroxyproline, Sodium Hyaluronate, Prunus Amygdalus Dulcis (Sweet Almond) Protein, Tocopherol, Xanthan Gum, Dehydroacetic Acid, Lactic Acid. 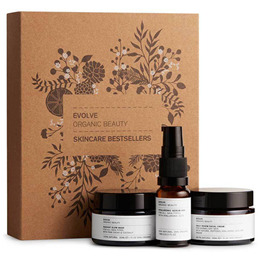 Below are reviews of Evolve Skincare Bestsellers by bodykind customers. If you have tried this product we'd love to hear what you think so please leave a review.